Chabad Double Bay's beautiful Chuppah is available for hire for your wedding. 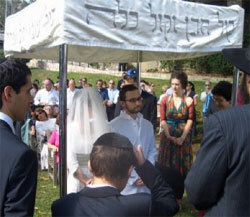 Call 9327 1644 or email admin@chabaddoublebay.com to reserve a Chuppah for your wedding. A Chuppah ('wedding canopy') is an integral part of a Jewish Wedding. It is a portable covered area where the bride and groom meet for the purpose of finalizing their nuptials. The chupah is considered the groom's domain, and the bride consensually joining him beneath his roof is the symbolically unifying act which finalizes the marriage. The ceremony takes place beneath an unenclosed canopy, open on all sides. This is a demonstration of the couple's commitment to establish a home which will always be open to guests, as was the tent of Abraham and Sarah.